Report Access Issues, Area Concerns or Missing Information, User and Wildlife Incidents. 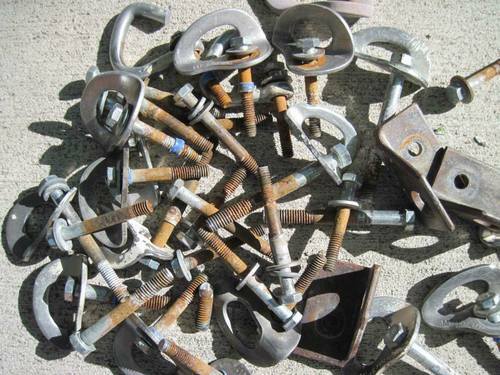 The Central Wyoming Climbers Alliance's Bolt-Anchor Replacement Fund (BARF) was created in the mid 1990′s to preserve the safety and integrity of fixed anchors in the Lander area. Since its creation, the BARF has replaced hundreds of worn and aged rappel and lowering stations. It has also replaced numerous lead bolts on the most popular routes. The fixed anchors used to create most of the sport climbs in the US are made of non stainless steel. As such, they are subject to corrosion that weakens the anchors holding power. Like most sedimentary rock, Wyoming’s Bighorn Dolomite, laid down in a shallow sea some 450 million years ago, contains salt and other corrosive agents that help to break down steel. The non-stainless steel bolts in the Lander area have been exposed to these elements since the first day they were placed, and as such were expected to last about 20 years. That 20 years is up, and the lead bolts need to be replaced. In the spring of 2013 the BARF took on the challenge of replacing all of the popular routes in Sinks Canyon and the Wild Iris. All told, this will add up to about 500 rock climbs, and an estimated 4,500 bolts. So that we don’t have to do this monumental effort again in 20 years, the BARF is replacing all bolts withcorrosion-resistant materials. Working with the American Safe Climbing Association (ASCA), the BARF is placing stainless steel glue-in bolts and stainless steel expansion anchors specifically designed for the rigors of our sport. Many of these fixed anchors are actually smaller and less visible than the older equipment, yet they are generally 20-100% stronger than the older designs. Though there are many variables in the aging process of a climbing anchor, the BARF hopes to see 50 to 100+ years out of the newer equipment. The BARF requests that all climbers establishing new routes use modern, stainless steel equipment that is specifically designed for climbing. This will assure that the new route stays safe well into the future, or that it doesn’t have to be replaced in 20 years. The BARF recognizes that this makes establishing a new route more expensive, but it is also the responsible way to protect future climbers and the precious resource that is our rock walls.